Pontiac’s OHC six cylinder was a pet project of John DeLorean in the 1960s when he wanted to introduce a more European driving experience to customers who preferred sprightly handling to brutal straight line acceleration. The engines were respectably rated at more than 200hp back when they were new but they were not exactly sold in the same volume as 400 and 455ci V8 engines that the muscle car crowd loved. This being said, there are still devotees of this engine family today and the video below is proof that there’s some power to be made in them thar cylinders if one wants to work hard at refining it. This particular engine has been stroked to 302ci and according to the video’s caption it makes 370 hp @5,500 RPM and 390 lb-ft of torque at 4,000 RPM. That’s enough to make any early Firebird really move out and freak the hell out of muscle car owners who had lazily tuned junk. The 370hp here is not just falling out of the sky. There are cool Weber carbs, likely some real magic in the camshaft department, and for sure some cylinder head work but the end result is an engine that’ll stand in the ring with any inline six from its era or today! Seriously, naturally aspirated and making that power?! There are people working on boosting these engines as well and one of them happens to be a BangShifter. How much power will his stuff make? Who knows but we know that we love it when people apply themselves to projects that are not the same damned thing over and over and over again. This engine build was a labor of love and we think it is highly successful. Sure, more power can be made from larger engines but the truth of the matter is that the wow factor of this thing outweighs all of that! 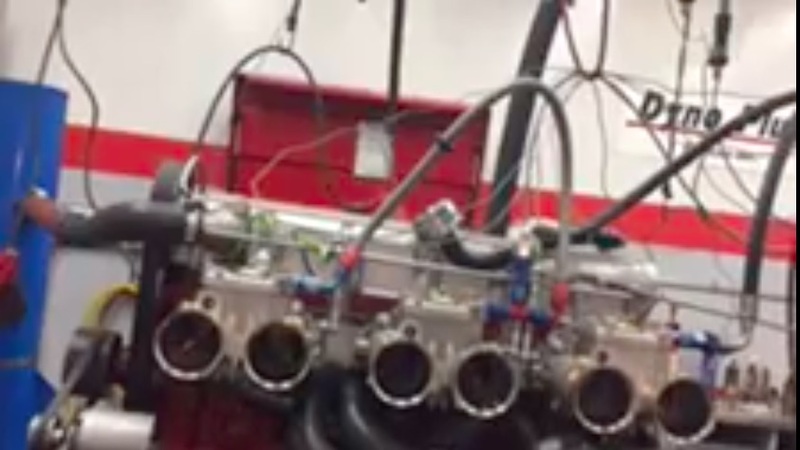 Press play below to see this 1968 Pontiac 302 OHC inline six stroker make 370hp! Best of 2018: How About A Coyote-Powered, RWD Ford Fusion? Best of 2018: What's The Strangest Animal Encounters You've Had At A Race Track? I’d like to see someone take on the old Pontiac 215 inline 6. It was a bit of a snail, but there are tons of them out there and they are dirt cheap. If the poor sap in that great movie Duel had had this motor in his car he’d have left that truck from hell in the weeds…..
That sounds wicked, love it! Hey guys… you need see more videos about the brazzilian GM250 inline six, especially the engines used on drag racing. All engines make 400+ naturally aspirated with triple webbers 55!